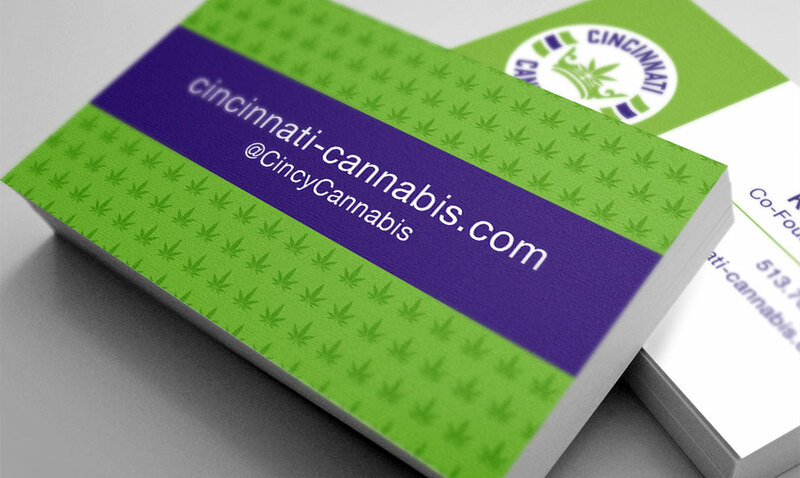 Cincinnati Cannabis is a family-owned small business, ready to meet the call “when prohibition ends” in Cincinnati. They are dear friends of ours, and we love working with them because we understand each other so well. They wanted to show the personality of the shop, which will be clean, bright, and well-decorated — this is a place where suburban moms will feel comfortable shopping. Also, they LOVE Cincinnati, and wanted to use iconic Cincinnati themes. So, rather than use the obvious ones, we incorporated parts of the Cincinnati flag (the wavy lines on the logo mimic the wavy lines from the flag, which represent the Ohio River). We also wanted to highlight the crown for the “Queen City”, with our special leaf addition for the main jeweled part of the crown. For the business cards, we carried the leaf motif to a subtle wallpaper pattern, similar to a fleur-de-lis. For the social media graphics and their starter web page, we used a wood background to add some texture.